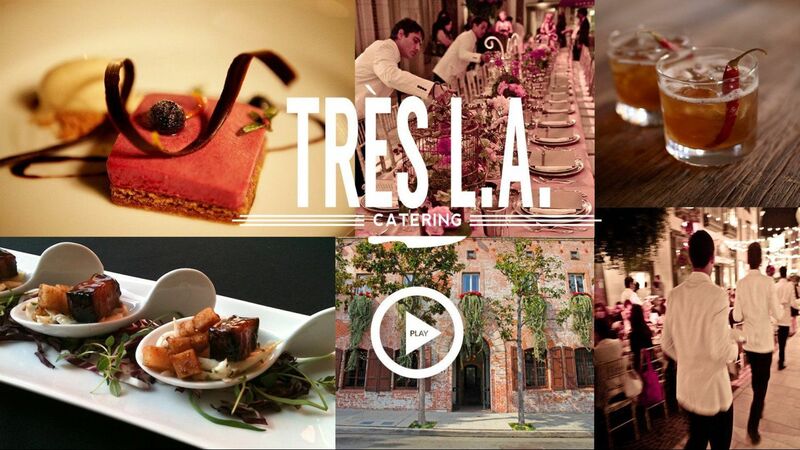 Many of our servers and bartenders have worked for Très L.A. for five or more years. Clients love seeing familiar faces and they will regularly ask us for servers that they know personally. We don't use staffing agencies and all of our servers are required to go though service training before they step on the floor for us. We want to ensure that you will always have a knowledgeable, professional staff of ladies and gentlemen with positive attitudes. There is never a dull moment at the Très L.A. kitchen as we are constantly testing, compressing, dehydrating, evaporating and sometimes sphering. For the Très L.A. Kitchen team, it's about being playful with the classics and continuously creating new and adventurous menus. We love the tiny touches. We make our own ice cream, roll butter with seasonal herbs, have nice sea salts on the tables, provide warm house made baskets of bread. We know that these small details have a large impact on the guests' overall experience. It doesn't matter if your guest count is 50 or 500, we won't overlook the "TNT". Like most college kids, I had no idea what I wanted to do when I started school. I grew up in Dallas, Texas and worked my way through The University of North Texas waiting tables and bartending. I enjoyed the work, but it was a means to an end and at the time, I really didn’t think of it as a life’s ambition. I finished with an Economics degree and enough knowledge to know that I didn’t want to be an Economist. My real education began the week after I graduated from college. I sold my car and bought a one-way ticket to Paris and traveled through Europe and Asia for over a year. In every way, this time in my life brought me an awareness and appreciation for other cultures that I don’t think I could have ever absorbed had I stayed in Dallas. When I came back home, I enrolled in the NYC theatre school Circle in the Square. I spent the next five years in New York as a quintessential struggling actor; which meant I was also a waiter and bartender. I moved to Los Angeles to pursue acting, but I landed a job as a Food and Beverage Manager at the Standard Hotel in Hollywood. This is when everything came together. It soon led to me taking a position as the Food & Beverage Director at The Standard's sister property––the iconic Chateau Marmont Hotel. After several years of providing hospitality and cuisine in a way that caters to the specific tastes of the most discriminating clientele in Los Angeles, I felt confident in starting a brand of my own. A catering company at the highest level, paring exceptional cuisine with luxury hotel-caliber service. Tres L.A. was created in 2003. In Tres L.A., my driving principle has been to leverage my past experience and deliver the same level of service, detail and visual appeal for our clients and their guests that I learned while working in the boutique hotel and restaurant industry. At the same time, foster a positive and spirited work culture for employees to grow and feel as if they are part of something more meaningful than just a stepping-stone in their journey. In 2011 I purchased what is now known as The Carondelet House and in 2015, I purchased The Ebell of Long Beach. I approached the remodeling and design of both venues like a blank canvas where I could fully curate every aspect of my work experience, my education and my travels. And I’d like to think both venues have become a pure expression of my vision as a host––warm, inviting, stylish and above all else, timeless. Our Director of Production and Design, Megan Tupper brings a balance of creativity and organization to the team that is unparalleled. Her tranquil demeanor shines from the beginning stages of the event through completion, which gives our clients and vendor partnerships a voice of comfort in what can often be a hurried working environment. She blends her artistic background with strong roots in hospitality to produce new ways of thinking in terms of presentation, service, and the overall guest experience. Megan believes food is inspiration, it is deep and meaningful. Her desire to continue growth within the industry and true passion for food is what sets her as a cut above the rest. Sharen Guzman is an integral part of the magic that is Trés LA. As our Event Sales Manager for Ebell Long Beach, her dynamic personality is magnetic. She has a natural ability to connect with people on an honest level, which is a refreshing take on the sales experience. With over 10 years in the hospitality industry, Sharen’s passion for food, cultures, and the gathering of loved ones truly shines. She is inspired to make a positive difference and believes nothing is more gratifying than bringing a client’s vision to life. A desert girl at heart, our Event Sales Manager for Ebell Long Beach, Jen MacLean exudes warmth to everyone she meets. She brings a level of expertise to the Trés LA team, as she has called Ebell home for going on 6 years. With over 300 weddings under her belt, her skilled strengths and lovely ambition ensure that no detail will go unnoticed. Jen’s welcoming personality, true smile, and willingness to give of herself establishes relationships that may start as clients, but inevitably become more like good friends. She has a passion for gathering people together and a strong cup of coffee. With her vivacious personality and big smile, Francesca Yaniz shines on the Trés LA team. As our Event Sales Manager for Carondelet House, she combines years of front-of-house service with her knowledge of production to the ensure the success of extraordinary events for her clients. Her career in events began in her hometown of Chicago, but since landing in California, she has played a key role here at Carondelet. Her positive energy mixed with Midwestern charm, allows her to build long lasting relationships with clients and vendors alike. Francesca operates from a place of love, and her attention to detail lasts every step of the way. Our Event Sales Manager for Carondelet House, Hilary Carreon is a spirited new face in the events industry. With over 10 years in hospitality, she has honed a level of service that is unparalleled. Her incredible attention to detail, organization skills, and reliability make her a stand out on the Trés LA team. Hilary was born and raised in Los Angeles with a deep appreciation for the food culture of the area. She loves working with her clients to bring their dreams to life and provides a calm comfort to everyone she interacts with. Elise Prizzi is a fresh face to Trés LA as our Production Manager. With over 8 years in the hospitality business, her quick thinking and ability to problem solve make her a driving force. She brings excellent organization skills and innovation to the team while managing our in-house operations to greatness. Her detail-oriented nature ensures that our venues and off-site productions run smoothly. Elise gives her all, so our clients can rest assured that every noticeable touch is handled. As HR and Staffing Manager, Shannon Truex is the backbone of our service here at Trés LA. Her leadership style begins with a positive attitude and is full of contagious enthusiasm. Shannon brings over 6 years of onsite event management experience combined with the development and implementing of training programs in both corporate and family owned restaurants. Her knowledge of serving, bartending, and captaining has ensured that she is equipped with strong skills within every aspect of front-of-house service. Her compassion and genuine ambition are what cultivates an environment of dedication amongst our team.